What is the Mini Cleanroom ? The Mini Clean Room was designed for a veterinary product company as a small microbiology laboratory. 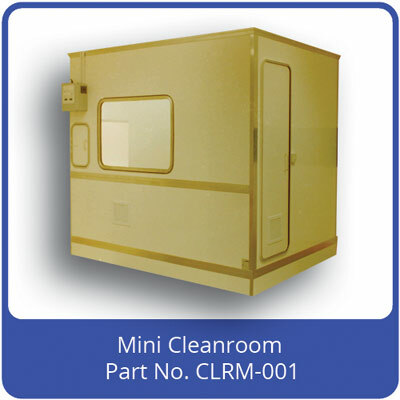 The Mini Clean Room is ideal for any application that requires product protection in a clean air environment. The work could be analytical, pharmaceutical or even electronic. No specific background air class is required. The Mini Clean Room has a fan/filter module sited on top which takes air from the room, passes it through a HEPA filter, then downwards as laminar flow over a work bench. Some air exits the lab directly and some exits via the airlock to ensure all areas are kept as clean as possible. The air change rate and pressure are monitored and displayed on the control panel located on the outside wall. As the Mini Clean Room is compact it is very affordable and cheap to operate in situations where only a small amount of space is required. The construction is of sandwich GRP (glass reinforced plastic) which is light, very strong and easy to keep clean. Also, as the Mini Clean Room is prefabricated at our factory, delivery and installation times can be kept to a minimum ensuring the least possible disruption.